A “Golden Weekend” is really a disappointing concept, I now realize as I sit here typing this. It simply means a 2 1/2 day weekend between rotations – no studying, no stress, no guilt. Only in med school do we get excited over 2 day weekends! Regardless of my sanity level, I spent my rare weekend off relaxing with girlfriends and visiting with my parents. Here is a recap of my weekend in pictures! When the boyfriend goes out of town, its time to get all the girls together for food, wine, and girly fun! It has been months since I have had time to entertain, so I loved being able to make a few recipes that have been collecting on Pinterest and test them out on a few friends. Coincidentally, they are both from Savory Simple… and are both amazing! We had some Jalapeno Poppers for an appetizer and Chocolate Covered Pretzel Peanut Butter Blondies (which I have renamed PMS Blondies) for dessert. Not only were they delicious, they were pretty simple to make! My parents drove up from New Jersey to celebrate my birthday with me, and spoiled me beyond belief! 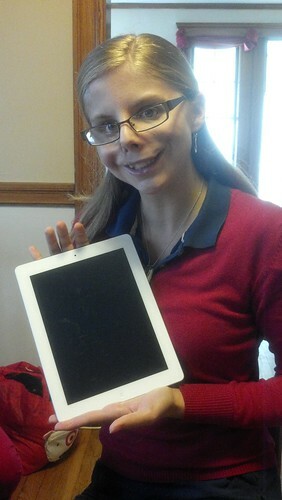 Not only did I get an iPad for my birthday (and finishing the boards and my two hardest rotations and Christmas!) 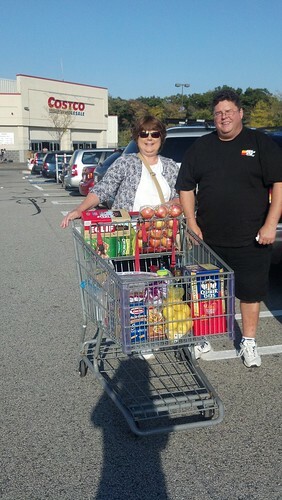 but they also stocked me up on some Costco pantry essentials and a few Whole Foods treats! After some major food shopping, what could be better than making dinner?! My parents asked where I wanted to go for my birthday, and after a month away from my kitchen, I decided nothing sounded better than a home-cooked meal. My aunt joined us for an amazing 3 course birthday dinner at home: cheese and crackers, lemon-herbed fish en papillote (loosely based on this recipe) with roasted asparagus, and leftover blondies with vanilla ice cream for dessert. 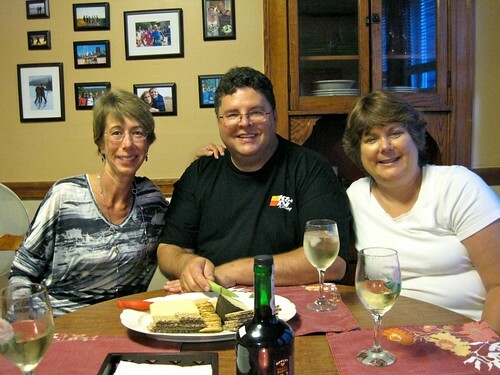 The day was filled with laughs, stories, and great food – a perfect day! Our morning was off to a healthy start with oatmeal, my Banana Bread Oats more specifically! (If I can turn my Dad into an oatmeal lover, anything is possible… I swear these oatmeal recipes are magic!) After church, we finished off an amazing weekend with Dim Sum in Chinatown. Filled with dumplings of all shapes and sizes, it was a fun way to wrap up a fun weekend with my parents! Question: What did you do this weekend? Did you try any new recipes or new restaurants? It has been humid this past week in Boston, and so I have been craving cold salads and anything frozen. Last summer, I made a heavenly frozen treat that I nick named “Monkey Bites.” When I got around to making them again this summer, I found a way to simplify and clean up the process. When I am not walking into doors or saying silly things, I am at least coming up with creative kitchen ideas! The recipe is about the same: bananas, chocolate, and peanut butter. But the method is simplified and cleaned up with some handy grill skewers. First, cut the bananas into bite sized chunks. Then, thread a few onto a skewer and pop them into the freezer for an hour or two. When they are almost frozen, melt down some chocolate and peanut butter. This is much easier than creating a peanut butter layer on each individual banana piece but still gets you some chocolate and peanut butter-y goodness in every bite! Then, take the skewers, and rotate the banana pieces in the chocolate, using a spoon to make sure they get fully covered. Pop ’em back in the freezer for 20 minutes, then slide ’em off the sticks and keep in a Tupperware in the freezer! They make a good snack or small dessert bite, perfect for steamy summer days. Enjoy! Question: Are you prone to blonde moments? Leave a comment telling your funniest silly story! Cut the banana into pieces. Slide, with space, onto skewers and freeze. Meanwhile, melt chocolate and peanut butter over a double boiler. Cover each banana piece with chocolate mixture. Freeze for 20 minutes on the skewers, and then remove to a storage container. See text of post for more detailed instructions. A perk of spending a week at home, besides the aforementioned grill (and spending time with my family and friends, of course! ), is full access to my dad’s well-stocked bar. I am not a big drinker, and usually go for a glass of wine or beer before a mixed drink. However, I like playing around with mixed drinks every once in a while! After adapting a sangria recipe and trying out Jenna’s Strawberry Rhubarb Margaritas, I was feeling inspired to dabble a little bit with cooking with liquor. I wanted to grill some fruit for dessert, and decided to spice things up a little bit. The pineapple was inspired by the margaritas, and the peaches combined a collection of flavors that I absolutely love. The recipes are simple: mix together the alcohol and sugar, pour over the fruit, let it sit for an hour or two (while you are making and cooking dinner), and then throw it on the grill. Make sure the racks are clean, and then place the fruit directly on the grill. Let it cook over medium heat for about 5 minutes. 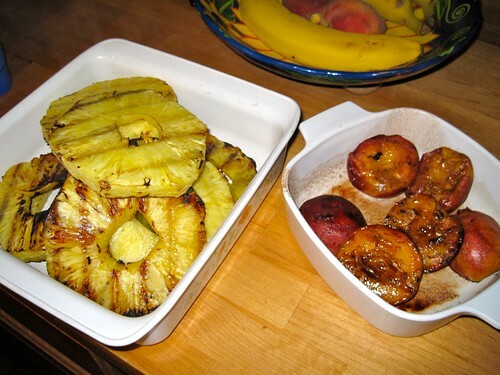 Turn over the fruit and drizzle the rest of the marinade over the fruit. Be careful of flame ups, or skip this step entirely. Cook for a few more minutes, and then serve warm. The aroma of this fruit is irresistible – just ask my mom and my sister. 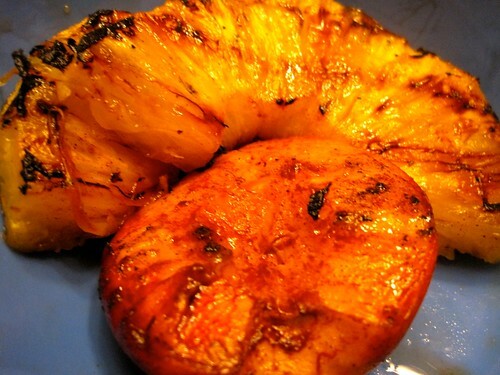 The pineapple flavor is simply enhanced, both by the tequila and by the heat of the grill. The peaches are transformed entirely – the texture softens until the fruit almost melts in your mouth, and the cinnamon, vanilla, and bourbon shine through. We ate these plain, but they would be amazing served with a scoop of vanilla ice cream as well! They make for a great sweet note for the end of a light, outdoor, grilled summer meal. Question: What is your favorite summer dessert? Mix together the ingredients, then pour over fresh pineapple slices or spears. Allow to sit for one to two hours. Grill over medium heat for 5 minutes on each side. Mix together the ingredients, then pour over peach halves. (Should be enough for up to 5 peaches). Allow to sit for one to two hours. Grill over medium heat for 5 minutes on each side. Question: Do you have any Valentine’s Day plans? In a small saucepan, combine the coconut, flour and coconut milk. Heat over medium low heat until the coconut starts to get sticky. Stir in the cherries. Form small balls and line on a cookie tray. Bake at 350 degrees for 15 minutes, or until slightly browned. While cooling, melt chocolate. (I added a drop of coconut milk for smoother melting). Using a spatula, drizzle the cookies with chocolate. Allow to set completely; store in an air tight container. The biggest roadblock for me over the past few weeks as a vegan has been community. I feel awkward accepting dinner invitations, hesitant to ask for restrictions on what my friends can cook but also unable to eat what I am served without question. Dining out can be difficult, depending on the menu. Hosting should feel like the easiest option, but I get nervous about my friends reactions to my “weird vegan food.” However, sharing meals with friends is an important part of my life, and I needed to face my fears of communal vegan eating head on this weekend. I met up with friends for lunch and was terrified of not being able to order anything at the tiny diner we ducked out of the snow into. I scanned the menu, seeing fancy omelettes, pancakes, homemade muffins… and I panicked. But then I saw the life-saving asterisk: for vegans/vegetarians, all eggs can be replaced with tofu or tempeh. At no extra charge, this was a miracle! I got to enjoy tempeh with home fries and veggies, which was a really filling and satisfying lunch! As my friend said, “only in JP,” commenting on the characteristic residents of this notoriously hippie Boston neighborhood. Not all restaurants are so vegan friendly, but I was happy to have a small hurdle to conquer my fear! My evening was spent catching up with a few friends from school over dinner, so I got to conquer my fear of serving friends “weird vegan food” as well. It was also an easy hurdle, since four of them were independently doing their own vegan challenge, and one was a former vegan. We laughed about experiences with friends, family, and servers; commiserated over the questioning of preparation methods and scanning of ingredients lists; and swapped recipes and new foods to try. It was such a great night, and the food was a hit! To avoid the, “Um, what did you say that is?” reaction, I wanted to find a recipe recreation that would be familiar to people’s taste buds. I chose Mama Pea’s Thai Fried Quinoa, since it harkens Thai pineapple fried rice and can be customized with various toppings. It was a huge hit and definitely a recipe I will make again! On the side, I made Sesame Kale Chips. Kale is a veggie-lovers green, but I have never met someone who could turn down a crispy kale chip. Even my Dad loves kale this way, despite his usual turned up nose when it appears in soups and stews! I omitted the lemon juice, used a little less oil, and added a dash of ginger. I will definitely be playing with different seasonings for my kale chips from now on, since these were so flavorful and not just overly salty! The green stuff went faster than the main dish, which I think speaks volumes! Vegan desserts on their own can be tricky, but another wrench was thrown in – my friends were also not eating any added sugar! Good thing I had these muffins on hand! A friend and I baked on Friday night, and certainly got our peanut butter and chocolate fix with these. I put out the rest of the muffins for dessert, and my friends were so excited to be able to enjoy a sweet treat at the end of the meal! You can’t go wrong with peanut butter and chocolate, and the natural sweetness comes from the dates. They are even healthy enough to fill the role of an on-the-go breakfast, making these another make again recipe! What I learned from my Saturday: don’t let fear hold you back! It might take a little more creativity, planning and thought, but you can enjoy communal meals and laughter with friends, no matter what your current food lifestyle choices are! Question: Have you ever been afraid of friends reactions to food you serve? A week of Christmas cookie posts would not be complete without at least one classic – the Gingerbread man! Gingerbread recipes are abundant, but this is by far my favorite. It is not cloyingly sweet, has the perfect amount of spice, and creates a soft cookie – my favorite way to have gingerbread. My sister and I have been making this recipe for years, and always love the results. The original recipe calls for vegetable shortening, but we forgot to check Mom’s cabinets before we started baking this year. With no shortening and no energy to run to the grocery store, we decided to substitute butter instead. My mom Googled shortening substitutes on her iPad and informed us that this would be okay, but that it would make the cookies soft and a bit harder to work with. (Seriously, what did we do before Google?!) We crossed our fingers and hoped it would work! The dough has to be chilled at least overnight, but ours ended up staying in the fridge for about 2 days, the outer limit of what the recipe allows. When we finally started to roll the dough out, we definitely saw the difference in texture that the shortening makes. The dough was very soft and sticky, and would stick to the counter and rolling pin without copious amounts of flour. However, my sister’s patience paid off! She came up with a system: The dough was split in two so she could work with one log at a time. She sprinkled a ton of flour under the dough and over the roller, and then worked quickly to cut out the cookies and place them directly on a baking pan. She would alternate between dough logs, keeping the other one in the freezer for a blast chill in the interim. After 10 minutes in a hot oven, we were greeted by the best gingerbread cookies we have made to date! Although the dough was hard to work with, the taste was by far superior to other doughs we have made with shortening. There was none of that shortening aftertaste that can haunt gingerbread recipes, and the texture of the cookie was perfect. Our final step was decorating. Let’s just say we have come a long way in our piping skills in the past few years! We spooned a classic Royal icing into sandwich bags, cut a small slit in the corner, and piped classic gingerbread men with simple outlines and faces. We used to go all out with colored sugars and candies, but we decided to stick with classic elegance this year. We couldn’t be completely uniform, though, and so had a bit of fun making a few characters! Any cookies that baked into funny positions we turned into named and specially decorated “gingies”. My favorites: a cookie with a “bullet hole” adorned with a Temple T in honor of the dangerous reputation that my sister’s school gets, the running man gingy donning running shoes, a few German gingies with curly hair and lederhosen, and a few wintertime guys with scarves. Still kids at heart, even with our much improved decorating skill! With so many cookies fresh from the oven, we made up a bunch of plates and boxes to send off to friends and family! A few boxes were put in the mail, a few plates were made for co-workers and neighbors, and the rest were hidden from mindless nibbling in the basement fridge. I think I am baked out for a good while now! Hope you have made a bunch of fun treats to enjoy over the holiday weekend. I am looking forward to enjoying Christmas cookies and spending more time with family and good friends, celebrating the greatest gift of all – the birth of my savior, Jesus. Have a great holiday! Question: What are your Christmas plans? Does your family have any fun holiday traditions? Sift the flour, baking soda, cinnamon, ginger, allspice, cloves, salt and pepper through a wire sieve into a medium bowl. Set aside. In a large bowl, using a hand-held electric mixer at high speed, beat the butter, about 1 minute. Add the brown sugar and beat until the mixture is light in texture and color, about 2 minutes. Beat in the molasses and egg. Using a wooden spoon, gradually mix in the flour mixture to make a stiff dough. Divide the dough into two thick disks and wrap each disk in plastic wrap. Refrigerate until chilled, overnight or up to two days. On the day you make the cookies, also prepare the Royal icing. Add the egg whites to a stand mixer and begin to beat. Add powdered sugar 1/2 cup at a time until a stiff icing forms. The Royal Icing should peak and not drip off the beaters when lifted. To roll out the cookies, work with one disk at a time, keeping the other disk refrigerated. Place the dough on a well floured work surface and sprinkle the top of the dough with flour. Roll out the dough 1/8 inch thick, being sure that the dough isn’t sticking to the work surface (run a long meal spatula or knife under the dough occasionally just to be sure, and dust the surface with more flour, if needed). For softer cookies, roll out slightly thicker. Using cookie cutters, cut out the cookies and transfer to nonstick cookie sheets, placing the cookies 1 inch apart. Gently knead the scraps together and form into another disk. Wrap and chill in the freezer for 5 minutes before rolling out again to cut out more cookies. Bake until the edges of the cookies are set and crisp, 10 to 12 minutes. Cool on the sheets for 2 minutes, then transfer to wire cake racks to cool completely. Decorate with Royal Icing, spooned into a sandwich bag with a small slit in the corner. Store between sheets of wax paper in an airtight container. That is how this recipe is saved on my computer, since those are the way I will always remember these cookies. Each year, my paternal grandparents would fly in from the midwest to spend the Christmas week with us, and each year we would make up an enormous batch of pizzelles. 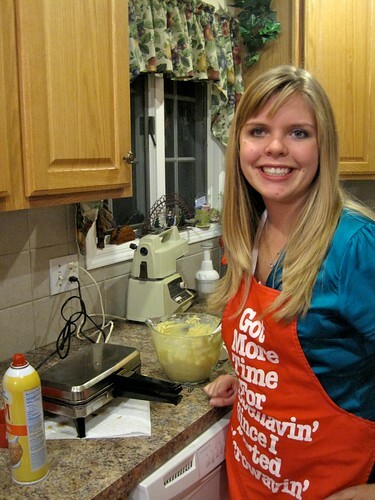 It would start out as a fun endeavor, but with a recipe that calls for a dozen eggs, we would soon tire of standing in front of the waffle iron. We would chug through, though, knowing how happy it made my Grandpa to have his favorite cookie on Christmas. We no longer spend the holidays together, but my sister and I still wanted to share this holiday memory with Grandpa. 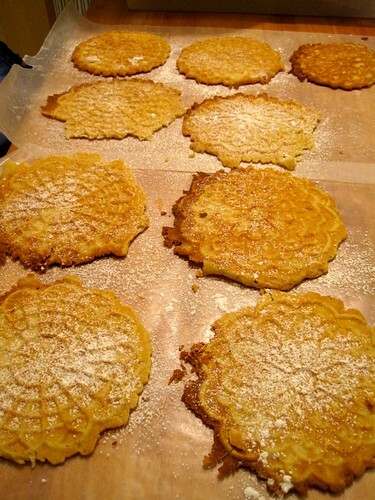 We halved the recipe, broke out the cookie iron that belonged to my grandfather’s mother, and made a batch of pizzelles. Maybe our attention span is longer than it used to be, but the process flew by! We ended up making two batches, sending the first to my grandparents and dividing the second among cookie plates for friends and our cookie jar. Question: Are you traveling to be with family for the holidays, or will you be hosting any out of town house guests? Whisk together eggs and sugar until well combined. Add the butter and whisk until smooth. Add vanilla and anise. Stir in flour until loose dough formed. 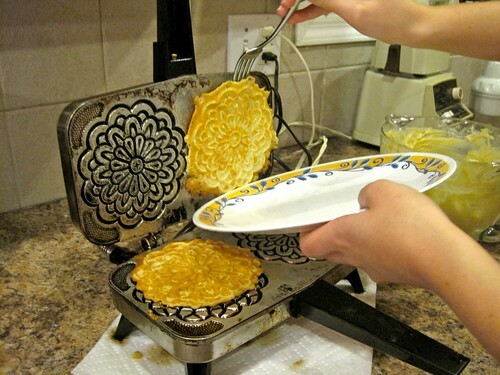 Heat the pizzelle iron. Coat with cooking spray. Add a spoonful of batter to the center of the iron and close. Cook for 1-2 minutes, then check the cookie. The pizzelle should be lightly browned. Remove with a fork to a plate, and then move to a flat surface covered with wax paper to cool. Before completely cool, dust lightly with Confectioner’s sugar. Repeat, adjusting the amount of dough added and watching cooking time as each batch will cook differently depending on how long the iron is in use. Like Homemade Adventure on Facebook!